Youth Lagoon, a.k.a. Trevor Powers, played the El Rey in Los Angeles this past Wednesday, one stop on a nationwide tour in support of his sophomore release, Wondrous Bughouse. The tour and album are markedly different than Powers' highly praised 2011 debut, but perhaps that's a good thing. While Youth Lagoon began as an introspective bedroom project tinged in adolescent longing, Powers has clearly matured as a musician and begun to explore the world. To achieve this new more intricate sound, Youth Lagoon has expanded to a full band. Consequently, Powers sounds less lonely. Though they played two popular tracks from the first album, "Cannons" and "17", Youth Lagoon mostly stuck to material of their new release. Pausing between songs, someone in the crowed yelled, "How are you?" And, Trevor Powers pleasantly responded with "I'm good. Thank you for asking. This place is beautiful isn't it?" The audience cheered in appreciation. This was a far cry from the tour of his first release when he toured with just an accompanying guitarist, barely interacted with the audience, and brought sympathetic listeners to tears. While a Youth Lagoon concert is still a beautifully intimate experience, it's become a different kind of intimate, friendly rather than confessional. These developments worked wonderfully for their new material, which driven by a drum kit thoroughly jammed and exuded all the psychadelic, otherworldly, experimental tones that make Wondrous Bughouse such an interesting album. The performance crescendo to an anthem-like end that left many in the audience with rapt smiles on their face. However, when the full band tackled Powers' earlier solo recordings, the songs ended up sounding like overblown ballads. All the same, I'm really glad I went to check this tour out. Given Powers tremendous developments as a musician, I'm eagerly anticipating the continued success of his career. Plus, I left in a thoroughly better mood, and picked up a physical copy of Wondrous Bughouse. 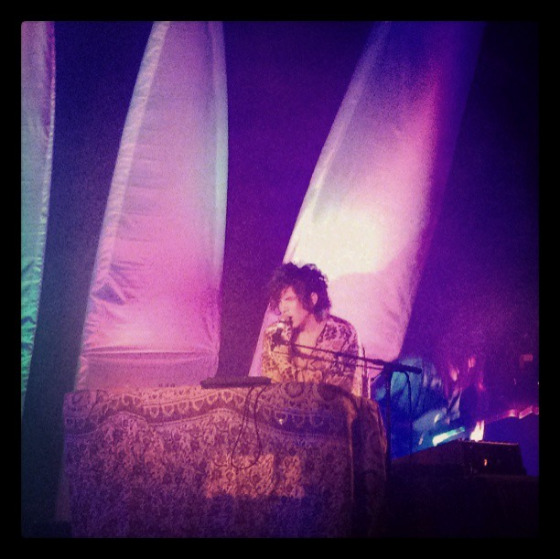 Basically, going to see Youth Lagoon live is always a good idea. KXSC Presents: Ella Fitzgerald's Birthday Party!